In the world of finance and control, the word “Blockchain” has probably been heard for the first time in the context of Bitcoin. In October 2009, the New liberty standard established the first online service to buy and sell bitcoins at an initial price of eight hundredths of a cent per bitcoin. By December 17, 2017, the price of bitcoin reached $19,500 and it became the fifth largest currency in the world in terms of total amount in circulation. Despite growing evidence that suggests that the Bitcoin and other major cryptocurrencies are exhibiting signs of a speculative bubble, cryptocurrencies continue to enjoy enormous investor interest. Subsequently, the blockchain technology has become an interesting area to explore for researchers and practitioners. Although the explosion of cryptocurrency in past few years has brought blockchain into the mainstream, “blockchain” is the new buzzword in every industry – investing, banking, education, healthcare, insurance, real estate etc. In the field of accounting and auditing, this radical and disruptive technology has greater pertinence which is worth exploring. Blockchain can be considered as a database which goes on building up incrementally by a network of participants who run the same software following the same set of constraints and rules. A “Blockchain”, as the name suggests, gets constructed by blocks of data that are gradually “chained” together. One can imagine it as a spreadsheet which is built up gradually by new cells being chained on. A blockchain database continues to be built and maintained as long as the software continues running. Therefore, unlike a single centralized entity, the chain continues to remain “alive” even if individual participants within the chain are pulled out (e.g. – bankrupted). Therefore, the “Blockchain” builds an indelible record that is completely resistant to any sort of tampering by any individual party. Thus, it is quite likely that such robust and transparent technology would attract more companies to join in crypto economy. As soon as such economy gets larger in size, the accounting firms will be forced to account for cryptocurrency transactions in their accounting process. 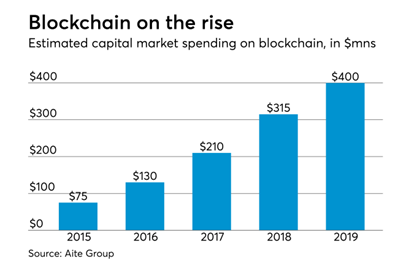 In the following figure, estimated capital market spending on blockchain over the years has been shown. It is clearly understandable that the accuracy of transactions through blockchain technology should not be a matter of concern for the companies. However, they need to plan for how the transactions should be recorded and presented in financial statements. Even the process of valuations based on accounting records also needs to be decided. It is expected that in long term more and more accounting records will be moved to blockchains and that will facilitate the auditing and control of transactions on real time basis. “Digitalization” or integration of digital technologies in day-to-day life is one of the recent developments across the industries. However, its impact on the accounting system is still at preliminary stage. The most possible reason may be the extremely high regulatory requirements in this domain. In order to keep intact the validity and integrity of the entire accounting system, mutual control mechanisms have been built using multiple checks and balances. This in turn demands for extensive documentations, duplication of efforts and periodical controls. These are majorly manual and labour intensive tasks with larger impact on cost and efficiency. However, the recently emerged blockchain technology carries huge promises in this context. While using this technology, companies can enter their transactions in joint register directly and create an interlocking system of long-lasting accounting records. This replaces the need of keeping separate records of all transaction receipts. Moreover, since these entries are cryptographically sealed and distributed, there is practically no possibility of destroying or manipulating them. Hence, the time and cost required to perform an audit would decline significantly. In effect, more complex transactions or sophisticated internal control mechanisms those need more attention from auditors will be rigorously verified resulting better outcome of audit process. Although the blockchain technology can radically change the entire accounting system, companies do not need to start with a joint register for all the accounting entries. Rather, it can be slowly integrated with conventional accounting procedures. It may start with ensuring integrity of accounting records and gradually form fully traceable audit trails. One of the factors that creates a barrier in the process of moving from paper receipts to electronic archiving is the perceived risk of unwanted modification. For physical instruments, especially for immutable records, chance of unnoticed modification is much lower than that of electronic files. This may be a potential reason why companies are not enough enthusiastic about digitalizing paper records. In this context Blockchain can be extremely helpful as a source of trust. By generating a hash string of a file, it may preserve the integrity of such electronic file. The hash string necessarily denotes the digital fingerprint of that file. The same fingerprint can be immutably time-stamped by scripting it in form of a transaction into the Blockchain. Subsequently, one can easily prove the integrity of the same file by matching newly generated fingerprint with the earlier fingerprint stored in the Blockchain. In case these two are identical, the document can be considered as unaltered since the time of first scripting the hash in the Blockchain. Although this new technology is expected to disrupt the entire accounting industry, the fear of replacement of human accounting professionals with much sophisticated “Blockchain” technology should not be a matter of concern. Rather, it offers a new opportunity for the accountants and CPA firms. They can now ensure the accuracy and truthfulness of the records to their employers and clients who are always worried about the safety and security of such records. Moreover, it’s also an opportunity for them to streamline the accounting and auditing processes and position themselves as innovative and forward thinking service provider. 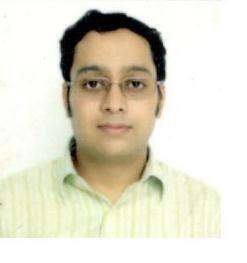 Therefore, the role of an accountant in this new accounting world will be changed but will certainly be not eliminated. This new technology aligns seamlessly with accounting profession. “Blockchain” basically deals with a new type of accounting ledger which can only be updated and verified continuously without any risk of being corrupted or altered. With the evolution, the accounting professionals need to learn this new technology and offer some valuable differentiated service to their clients. More quickly they adopt, more beneficial it would be for them before the technology becomes standard and part of our daily jobs. What do the “Big Four” think? The current practice of auditing can be made far more automated even without pouring through the paper trails. “Blockchain” technology facilitate such auditing process by verifying key data underpinning company’s financial statements. For example, smart contracts that are automatically executed can be readily verified using codes. However, the auditors need to be familiar about the finer nuances of this new technology. In this regard, it is imperative to track how the world’s biggest four auditing firms – Deloitte, Ernst & Young (E&Y), KPMG and PricewaterhouseCoopers (PwC), better known as “Big Four”, are planning to deal with this major development. E&Y is the first which has started accepting Bitcoin as a payment method. In April 2018, it has launched “Blockchain Analyzer” which will facilitate the review and analysis performed by E&Y audit teams on blockchain transactions. The pilot project aims to build the mechanism behind automated audit tests on assets, liabilities, equities and smart contracts that are recorded in blockchain. KPMG, a member of the Wall Street Blockchain Alliance”, has partnered with Microsoft to launch “Blockchain Nodes” initiative to identify and use new applications of blockchain technology. Besides, KPMG has started a “Digital Ledger Services” program back in 2016 to assist financial services companies in identifying blockchain applications. Similar to E&Y, PwC has also started accepting Bitcoin as a mode of payment from December 2017 at its Hong Kong office. Deloitte has launched Rubix, a “one-stop blockchain software platform”, way back in 2014. Using this platform, Deloitte started exploring initial coin offerings (ICOs) as an instrument to diversify their offerings. It is clear from the above discussion that although the “Big Four” have not yet started their auditing services directly using “Blockchain” technology, but they are very much into the development phase. For example, In April 2018, PwC has announced its first ever blockchain auditing services which aims to ensure whether the already signed up crypto businesses are using this technology properly and effectively. Recently, the “Big Four” have joined a consortium of 20 Taiwanese banks to trial an auditing run on interim financial reports of public companies using blockchain service. Blockchain can be considered as a source of trust which has the potential to bring a radical change in history of accounting. It safely records all transactions, reconciles and stores them permanently in the chain. In a way it provides speed, efficiency, accuracy and truthfulness. This, itself, is a major development over traditional accounting system which is fraught with errors and fraud. Although there lies a number of challenges, it can be easily combatted if accounting industry, its leaders, regulators and technology providers work together to achieve a win-win situation for all the parties. Once such challenges will be overcome, blockchain technology will undoubtedly emerge as a new frontier of modern accounting.